Situated in stunning countryside, with the lovely beaches of Cardigan Bay and Pembrokeshire in easy reach, this self-contained cottage provides a secluded rural retreat, perfect both for large family holidays, as well as short country breaks for smaller parties. The cottage commands superb views across the beautiful Teifi Valley and provides immediate access to fifteen acres of private woods and farmland, with woodland walks and abundant wildlife. The tastefully restored and furnished cottage combines period charm and features (oak and traditional tile floors, open fireplace and vaulted beamed ceilings) with modern day comforts and facilities (carpeted bedrooms, DVD and TV, dishwasher, central heating, microwave etc!). The cottage sleeps up to 7 people (plus cot available on request) and comprises 4 bedrooms, bathroom, kitchen and large living/dining room, providing spacious self-catering accommodation of a high standard. 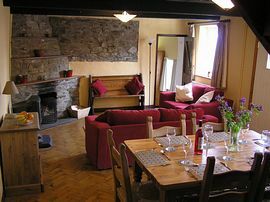 All rooms are centrally heated, and there is also an open fireplace in the living room (wood available by arrangement). The spacious living/dining room is furnished with comfortable seating, TV, DVD and CD player, as well as farmhouse dining table and chairs. 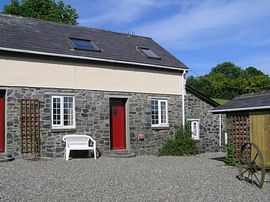 All 4 bedrooms have far-reaching views over the Teifi Valley. The master bedroom benefits from a dual aspect, vaulted beamed ceiling and kingsize bed. Further bedrooms comprise a double, twin and single, all provided with appropriate storage space. The light and airy refitted bathroom incorporates bath, toilet and shower. The stylish kitchen is recently refitted with units, gas cooker and hob, fridge, dishwasher, washing machine, and microwave. 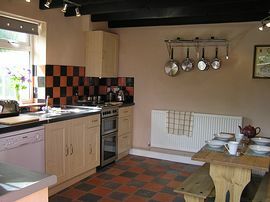 There is traditional welsh quarry tile flooring and a breakfast table and seating. The kitchen and living room open out onto a private enclosed south-facing courtyard with garden furniture and barbeque, and private parking space for 2 cars (further parking available to side of property). An outbuilding across the courtyard provides ample secure storage for mountain bikes, canoes, fishing rods etc. 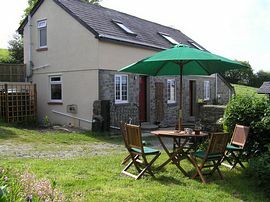 An additional lawned garden (also enclosed) is available to the rear of the holiday cottage. Local attractions include the beautiful beaches of Ceredigion and Pembrokeshire (about half hour away), the Gwili and Teifi Valley steam railways, and numerous historic castles. 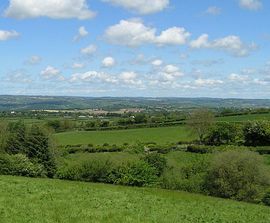 The local area has a network of quiet country lanes and footpaths ideal for mountain biking, walking and horse riding. The River Teifi provides opportunities for fishing and canoeing, and salmon can sometimes be seen leaping the falls at Cenarth. Folly Farm and the Oakwood theme park are within easy reach. Secluded rural retreat surrounded by private mature woods and farmland. Recently refurbished and furnished throughout to a high standard. All bed linen provided including sheets, duvets, duvet covers, pillows and pillow cases at no extra charge. Towels not provided. Cot bed linen not provided. One well-behaved dog is allowed by arrangement at time of booking. Restricted to cottage kitchen only and kept on lead around farm. Private enclosed south-facing courtyard with garden furniture and barbeque. Direct access to 15 acres private woods and farmland with trails and abundant wildlife. Parking for 2 cars (further parking available to side of cottage). Outbuilding provided for secure storage of bikes, canoes, fishing rods etc. Additional lawned garden (also enclosed) is available to the rear of the cottage. Local Services: Spar shop, post office, country pubs in Drefach Felindre (2 miles). Supermarkets, shops, swimming pool, leisure centre, restaurants etc in Newcastle Emlyn (5 miles). From Carmarthen take the A484 towards Cardigan. After about 10 miles pass through the hamlet of Cwmduad. After a further mile turn left signposted Cwmpengraig. Continue straight through the Five Roads Junction towards Hermon. The farm entrance is 150m on the righthand side. Follow the track down to the cottage. Weekly rates range from £300.00 to £540.00 in summer, £300.00 to £380.00 in spring and autumn, and £165.00 to £300.00 in winter. Short breaks and weekend breaks range from £120.00 to £250.00.